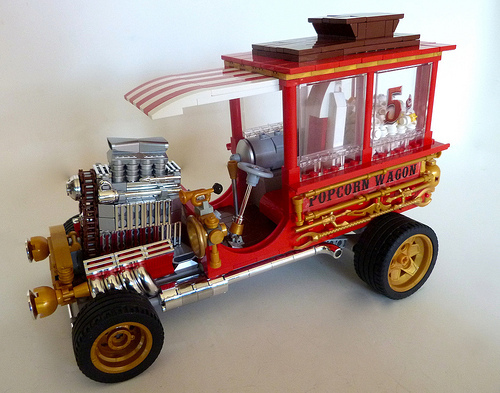 Those of you who read this blog regularly will have seen tricked out and wacky hot rods by Lino Martins (Lino Martins) before, but few rods are as tricked out, as wacky or as hot as his latest creation: the Popcorn Wagon. He normally builds his own custom designs, but this is a model of a real-world show rod from the sixties. These things weren’t so much cars (nobody knows whether this one can even drive under its own power); they’re sculptures on wheels. There is something oddly ‘meta’ going on here. Show rods are almost like real-world versions of the sort of vehicles Lino normally builds, which themselves are a kind of sculpture with wheels. Gnarly!